Alphabet, designed in 1960, features a densely packed jumble of randomly sequenced characters. The quirky, blocky text defies reading but functions beautifully as a texture, its forms melding into an overall pattern with a hard-to-find repeat. The design is at once gridded and organic, orderly and irregular. Alexander Hayden Girard, Names, 1957. Relaunched by Maharam in 2004. Lettering also appears in Girard’s Names, a textile built from lines of handwriting whose loops and curlicues make it impossible to decipher. Both Alphabet and Names were released by Maharam under license from the Girard Studio in 2004. 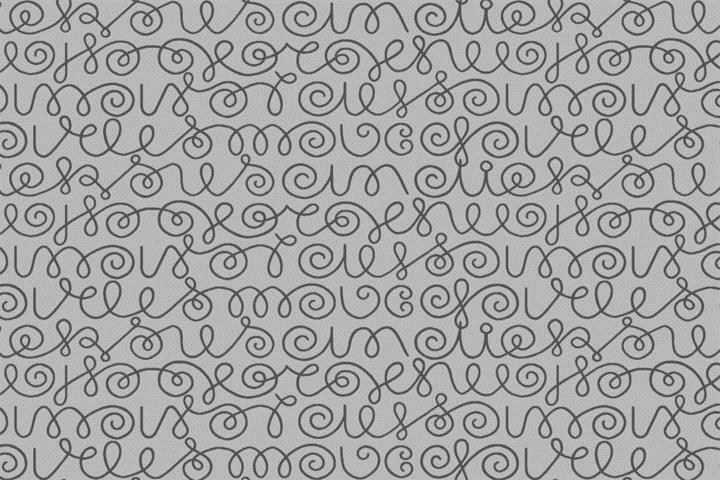 Creating text that you can’t read is the goal of most pattern designs built out of letters. Such designs aim to channel the abstract qualities of type—their lines and curves, their individuality, their family relationships—into fields of graphic marks liberated from the task of direct communication. 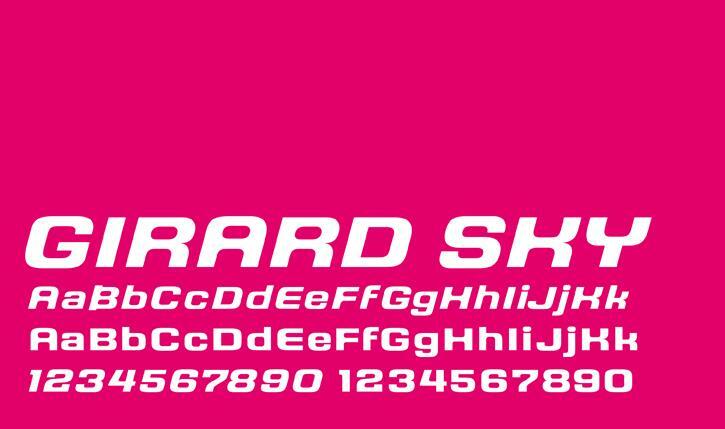 Alexander Hayden Girard, Sky, digital typeface. Created by House Industries, 2009, based on Girard’s lettering for Braniff International Airways. Girard was a skilled graphic designer who could communicate when he chose to. His far-reaching corporate identity project for Braniff International Airways in the mid-1960s encompassed everything from interiors and textiles to the airline’s logo and ad campaigns. In 2009 the Delaware-based type foundry House Industries released a series of digital fonts drawn from Girard’s lettering work, including Sky, based on the tech-inspired Braniff alphabet, and several of the designer’s loopier, softer lettering motifs. 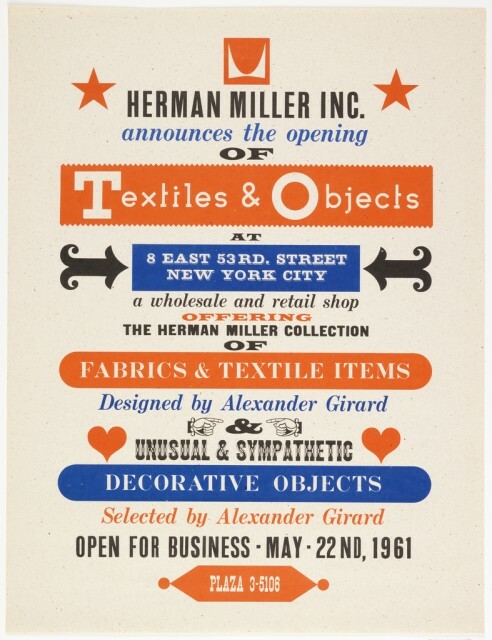 Poster: Herman Miller Inc., Textiles & Objects, 1961 Designed by Alexander Hayden Girard, John Neuhart, 1961. Gift of Marilyn and John Neuhart, 2004-13-1. Girard, who was an avid collector of folk art, toys, and popular artifacts, founded the store Textiles & Objects with Herman Miller in 1961. His shop featured pillows and other goods made from Girard’s signature fabrics as well as house wares hauled back to New York from the designer’s travels around the world. The store didn’t last long, but its spirit lives on in the lifestyle collections of Jonathan Adler and other twenty-first century designers who have drawn ideas and inspiration from Girard’s bold, witty application of bright color and snappy graphics to objects for daily use. Todd Oldham and Kiera Coffee, Alexander Girard, 2011. Ammo Books. Among Girard’s contemporary admirers is the multidisciplinary designer Todd Oldham, who published a lavish monograph on Girard in 2011. Gracing the book’s cover is the famous Alphabet pattern. 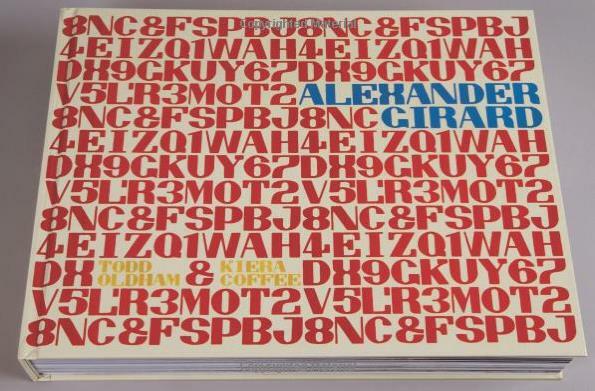 Slotted into the pattern are the letters of Girard’s name; they quietly announce themselves from within the vibrant, noisy crowd.